Last month, I was among a small group of bloggers invited to visit some special regions in Spain by the luxury wine group MG Wines Group. MG Wines focuses on wines of distinction from various regions in Spain, and this fam trip was all about the unique, the sublime, and the special wines that MG owns. From the far southern deserts of Bullas, and Jumilla, to the cold, wet north Bierzo, we visited three wineries that were tied together by their dedication to sustainable agriculture, wine making techniques and culture, and yet very different in style and taste. I love Spain; each time, I come away more enamored than I was before. I was excited to be included in this small group of wine writers, not only because they were all good friends and people whom I consider talented writers, but also because it was my first time experiencing Jumilla, Bullas, Alicante, and Bierzo. We began our trip in the southern Costa Blanca city of Alicante. More well known for it’s beaches, seafood, and sun seeking Brits than it’s wine, Alicante is a bustling town newly connected to Madrid with a high speed rain link that makes travel a breeze. Nearby, there are several wine producing regions that focus on Monastrell (Mouvedre) and Alicante Bouchet (known as Garnacha Tintarero here), and are delicious alternatives to the more widely known Rioja. 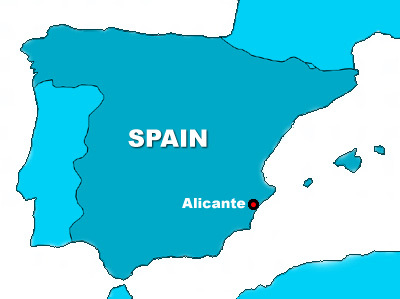 As you might have guessed, Alicante gives it’s name to Alicante Bouschet, the red skinned, red fleshed grape that was so popular in Italian field blends in California’s wine history. BUt this wine is so unique that you pre-concieved notions will go out the window. Alicante is it’s on DO, or Spanish Demoninacion de Origen, and is currently in ti’s 75th year as a DO, even though winemaking traditions can be traced back to the Roman times. Here, Monastrell and Alicante are king among the bold, dark red wines that are growing in popularity and elegance. After settling in to our hotel in Alicante, the intreped Ole Winos cast out for a tapas crawl on the waterfront. While it was still late winter / early spring, we bundled up and enjoyed some local wine, cava and delicious eats before our adventure began in earnest the next day in Jumilla, home of Bodegas Sierra Salinas. Stay tuned for more on that one of kind experience! Thanks for sharing your wine tour to southern Spain. Find it very interesting to go through it and get some useful information.